Other than students themselves, teachers are the most significant input in the public education system. A substantial body of research shows that having a highly effective teacher in a classroom is the most important within-school factor affecting student achievement, and the effect of a great teacher can help address or even overcome the negative impact of variables beyond the control of the school such as economic disadvantage and family factors.1 And teacher salaries comprise the largest percentage of school budgets, making teachers the biggest economic driver in the system. The national conversation on education policy has focused heavily on teacher quality. Traditionally, federal and state policies regarding teacher employment and compensation have been structured primarily around input measures — favoring seniority and advanced credentials. But in the last several years, the conversation has shifted to focus on measuring outcomes and structuring incentives for teachers more prominently around performance. States and districts across the country have made significant changes to the way in which teachers are evaluated and to thinking and practice around how that data is used in personnel decisions regarding compensation, teacher support, tenure, and dismissal. These changes have not been without controversy, particularly related to linking high-stakes decisions for teachers directly to student test scores, and the debate is ongoing. In addition to the evaluation and performance management of those already in the classroom, attention has also focused on the teacher pipeline — examining the role of teacher preparation as well as on teacher quality. This attention has primarily come in the form of attempts at improving the measurement and communication of teacher prep program quality, and particularly in establishing links between programs and the effectiveness of the teachers they produce. This chapter examines the makeup of the current teacher workforce in the United States, exploring trends and changes over time and what is known about how some of these demographic factors relate to measures of effectiveness. It discusses incentives like compensation, tenure, and pension policy — and how these systems are often structured in ways that disconnect job performance from critical personnel policies. It then describes recent shifts in policies around teacher effectiveness — primarily focusing on changes in teacher evaluation and measures of effectiveness and the associated implications for personnel policies. Finally, the chapter looks to the future of the teacher workforce — discussing issues related to the production of new teachers. Historical and current trends in demographic data highlight at least a couple of issues in the teacher workforce. First, there are considerable demographic differences between teachers and the students they serve — and these differences may increase as the student body becomes increasingly diverse. Second, schools now employ many more teachers with far less experience than they have in the past, raising questions around the attractiveness and stability of the teaching profession. Additionally, some of these demographics play a pivotal role in public school personnel policies. Experience and education credentials are the prime determinants in teacher compensation and other policies. These practices have a long history but are currently undergoing a shift as measures more directly related to job performance are increasingly brought to bear. The teacher workforce in the United States comprises about 3.4 million teachers serving nearly 50 million students in public and charter schools. Over the last decade, the size of the teaching workforce remained relatively stable, ranging from 3.25 million to 3.4 million and growing at roughly the same pace as the student population. The demographic composition of the teaching workforce is predominantly female (76 percent) and white (82 percent), and these trends have changed little over time, though the composition of the student body has become increasingly diverse. Source: U.S. Department of Education, National Center for Education Statistics, Schools and Staffing Survey, available from: http://nces.ed.gov/surveys/sass/. In the most recent decade, the most marked demographic shift among students has been a decrease in the percentage of white students and an uptick in the percent of Hispanic students. According to the most recent data available, one out of five students is Hispanic. In contrast, only one out of 12 teachers is Hispanic. Similarly, about one in six students in public schools is black, compared to one in 14 teachers, though this trend has been relatively stable over the decade. In terms of experience, over the long term the teacher workforce is trending toward less experience. In 1988, the modal years of experience among teachers was 15. By 2008, that modal experience level had shrunk to one year. That trend has softened somewhat since 2008 — the modal years of experience has climbed to around five. But there is still a higher proportion of less experienced teachers in the workforce compared with 20 years ago. The proportion of the teacher workforce with 10 or fewer years of experience has fluctuated from 37 percent in 1988 to nearly half in 2008 and 45 percent in 2012. Analysis of the distribution of experience within the teacher workforce shows lower proportions of the least experienced teachers relative to those with the most experience, but it also shows a hollowing out in the middle with a dip in the proportion of teachers with 10 to 15 years of experience (Figure 2). During the five-year period between the 2007—08 and 2011—12 school years, the concentration of teachers in their first few years of teaching declined markedly, while the proportion of teachers with 10 or more years of experience grew. At the same time, the population of teachers in the middle, those with four to nine years of experience, remained stable (Figure 2). The most recent economic recession has certainly affected these trends. Numerous press reports have documented educator layoffs across states and districts. State and local policies regarding tenure often influence which teachers are retained when reductions are made, influencing overall attrition and retention trends. And economic conditions undoubtedly affect the choices of those considering entering the profession, as well as teachers who might consider leaving voluntarily. Consistent with the federal definition of “highly qualified teachers” from NCLB, all states require a bachelor’s degree to qualify for a teacher license in the majority of fields (exceptions exist for certain career and technical education fields). As of 2012, over half of all teachers held a master’s degree or higher (Figure 3). And over the previous 10 years, that percentage grew, which is consistent with the substantial financial incentives many districts provide to teachers who earn graduate degrees. As with many professions, the rise of organized labor in the first half of the 20th century brought protections for teachers — most notably tenure policies designed to prevent unfair dismissal, uniform salary structures to help address issues of low or inconsistent pay for similar work, and pension benefits. Those structures created job security for teachers, who historically faced threats of dismissal for trivial personal or political reasons and inconsistent compensation for similar work, and established strong incentives in the system based primarily on longevity. Despite significant changes in the labor market broadening opportunities for women and rising expectations for the role of teachers and schools, these structures and incentives have persisted almost unchanged to the present. Nearly all (89 percent) school districts compensate teachers according to a uniform salary schedule that pays teachers based solely on years of experience and the level of degrees earned. Research links teacher experience to improved outcomes for students through the first few years, but the structure of most salary schedules does not align to the evidence. On average, first-year teachers are less effective than more experienced teachers, but they make significant gains in their first few years before their performance tends to level off. But most educator salary schedules do not align to this trajectory of teacher improvement. The traditional pension system favors the small percentage of teachers who stay for an entire career, and the vast majority of their pension wealth is accumulated in the last few years of service (usually after about 30 to 35 years).19 20 21 For all but a few teachers, pension wealth is modest; in many cases, it is nonexistent. Recent reforms have further whittled away at pensions by cutting benefits and imposing greater restrictions for new hires in an attempt to pay down liabilities accrued over years of inadequate funding and poor returns in the stock market. Structuring a modest long-term benefit such that real value often does not begin to accrue until well after the period when many teachers leave the profession does little to provide an incentive for good teachers to stay longer. And the reality of comparatively low salaries and minimal retirement benefits in many school districts coupled with the fact that most teachers are not covered under Social Security has implications for stability and longevity in the teacher workforce overall. Among the 15 uncovered states, an average of 52 percent of teachers will not vest into their state retirement system, according to state pension plan withdrawal assumptions. Because of high mobility in the teaching profession and rules that penalize young and mobile workers, roughly half of all teachers nationwide will not qualify for even a minimum pension benefit. Additionally, over 40 percent of teachers are not covered by federal Social Security (in 15 states, virtually no teachers are covered). In addition to compensation structures that largely discount performance, tenure policies can separate teacher performance from employment decisions. And in some states, tenure policies allow ineffective teachers to remain in classrooms when schools must make layoff decisions — even in the case of serious misconduct or chronically poor performance. Tenure provides teachers protections aftera certain number of years on the job. Originating in the early 1900s to protect teachers from facing arbitrary dismissals, laws vary by state, but most commonly stipulate that teachers receive tenured status after three years.25 Tenured teachers can still be fired, but dismissal requires due process. As such, the dismissal process can be slow, cumbersome, and costly.26 In the majority of states, tenure is granted and held based on years of experience, not performance, though that is beginning to change. Recognizing the importance of teacher quality and the disconnect between job performance and compensation and other personnel policies, policy-makers have started shifting focus to both the evaluation of teacher effectiveness and the application of that information to improving the overall quality of the teacher workforce. But most teachers are still paid solely based on years of experience and educational credentials. Recent legal actions in a few states have raised larger questions about the future of teacher tenure policies. As previously discussed, research links experience and effectiveness. And though that relationship is statistically stronger than many other measurable characteristics, including holding advanced degrees, test scores on licensing exams, and other input measures, experience still explains a relatively small proportion of teachers’ impact on student achievement.31 32 33 34 35 Given the lack of research-based support for effective teaching practices and weak links between other measurable inputs and teacher effectiveness, more recent focus has turned to outcomes-based measures — examining the impact of individual teachers on the achievement of the students in their charge. With 43 states (including the District of Columbia) currently operating under a waiver, recent years have seen substantial movement among state policymakers to develop systems — or improve existing ones — to evaluate the current performance of teachers in a fair and objective manner. Better evaluation systems are also designed to provide districts with the data they need to make performance management decisions — such as professional development, compensation, and tenure — around teachers and school leaders. States have attempted to address these concerns through the design of both the measures of student outcomes and through the manner in which student outcomes factor into teacher evaluations. While teacher evaluation systems vary across the country, no state or district has attempted to develop or implement a system that evaluates teachers solely based on student test performance. Instead, states are adopting policies to improve how districts evaluate and influence teacher performance using multiple measures. The most comprehensive evaluation models incorporate student learning outcomes while also capturing other dimensions of teacher quality, through both objective and subjective evaluation tools. Under teacher evaluation reforms, as of 2015, all but eight states have committed to using an objective measure of student achievement — such as performance on standardized assessments — as a part of teacher and principal evaluation systems.40 However, given the challenges of fairly incorporating student test performance in evaluations, all states and districts engaged in these reforms must account for factors like the variation in student background and other external influences on performance. Many states now require the use of value-added models in evaluations as a measure of the a teacher’s or school leader’s impact on student achievement, as determined by results on state standardized tests. Value-added models generally use statistical methods to isolate the impact of a factor of interest (like being taught by a particular teacher) on an outcome (like a test score) by mathematically removing the effects of other factors (like student family income or prior performance levels). In doing so, these research-based models are designed to assess teacher performance in a way that reduces bias favoring those teaching more educationally advantaged students. A value-added measure based on a standardized test score is primarily predictive of the influence of teaching on standardized test scores; and value-added measures are found to be strong predictors in this capacity. And studies have found teachers’ value-added scores in one year to be partially predictive of impact on student performance in subsequent years. Their ability to measure influence on a broader definition of student achievement, however, is limited by the degree to which the testing data incorporated in the value-added model correlate with student achievement beyond the test score itself. In other words, if an Algebra I assessment is a poor measure of whether a student has mastered Algebra I concepts, then a value-added measure tied to that assessment would indicate how much the Algebra I teacher influenced student performance on the assessment, but not necessarily how much the Algebra I teacher influenced student mastery of Algebra I. This “Garbage In, Garbage Out” issue, however, points to a challenge in ensuring validity and reliability in assessments, not to a flaw in the concept of value-added measures as a measurement tool. Concerns regarding the complexity and accuracy of value-added measures have fueled debate regarding the degree to which value-added measures should be included in teacher evaluations, particularly when evaluation results are tied to high-stakes employment decisions. But proponents of value-added measures point to their relative strength compared to other predictors of effectiveness, particularly when used as one component in an evaluation system combining multiple measures. In addition to debate over their technical merit, one generally agreed-upon and significant drawback of value-added measures is that they can only apply to teachers in tested grades and subjects. To evaluate the majority of teachers who do not teach tested grades and subjects and cannot receive a value-added score, districts must use other measures of student growth. And they must consider the relative rigor of different methodologies used for purposes of evaluating teachers in different grades and subjects. One type of alternative measure, Student Learning Objectives (SLOs), involves articulating specific learning goals for a course or subject area and measures to track progress toward those goals. 48 Individual teachers and school leaders can develop SLOs and apply them to particular instructional contexts. As such, they can be adapted for a variety of grades and subjects, and they can incorporate district-wide assessments, end-of-course exams, or other measures of achievement, such as student performances for subjects, including art and music. In contrast to student growth and value-added measures that cannot be applied uniformly across subject areas and grade levels, classroom observations are a universally applicable measure that can provide insight into how all teachers are performing. Classroom observations also offer real-time feedback to teachers so they can make changes to their instructional practice during the school year. These rubrics were found to be useful in identifying teachers who were most effective at improving student learning outcomes. That said, while the associations between the observation tools and student achievement were statistically significant, they were not particular strong. But the study also showed that the predictive power of these rubrics strengthened when classroom observation scores were combined with measures of student achievement gains and student surveys. Since 2009, many states have succeeded in implementing certain teacher evaluation reforms (Figure 5). But even the best-designed teacher evaluation policies can only effect change if they are implemented well. Because states’ evaluation systems are still relatively new, fully assessing their impact on teacher effectiveness is difficult. But many states’ systems reflect promising practices. For one, states are beginning to evaluate educators more frequently. As of 2015, 27 states required annual teacher evaluations, and 31 states required annual principal evaluations. Thirty-nine states incorporate objective measures of student achievement data into teacher evaluations, and of those, 17 report it is the most significant factor.55 And most states now use at least three tiers to differentiate teachers (Figure 6). One early indicator of a model’s impact is the extent to which it leads to differentiation of teachers by performance. Increased differentiation in teacher ratings is crucial for a district to identify its highest and lowest performers, provide teachers the support they need, and make performance-based personnel decisions. Louisiana offers one such example: under its previous binary evaluation system, 98.5 percent of teachers received a rating of “Satisfactory.” After the state implemented the new four-tier Compass model in the 2013–14 school year, 43 percent received the highest rating of “Highly Effective,” while 8 percent were classified in the lower two tiers (6 percent in “Effective: Emerging” and 2 percent in “Ineffective”). Merely adopting a multi-tiered system may not result in schools and districts effectively distinguishing among high- and low-performing teachers. When Delaware rolled out its new evaluation system in the 2012–13 school year, 99 percent of teachers were categorized as “Highly Effective” or “Effective.” Only 1 percent of teachers received the third rating of “Needs Improvement,” and 0 percent of teachers received the lowest rating of “Ineffective.”58 Delaware may be an example of a state facing challenges in using all its evaluation tiers to meaningfully differentiate teachers. Robust teacher evaluation systems can only lead to improved teacher quality if schools use the resulting data effectively. Schools and districts can use teacher evaluation data to inform meaningful decisions around on-the-job support as well as compensation and employment. As of 2012, the vast majority of districts still had a salary schedule in place, and only 11 percent of districts used pay incentives to reward teachers for excellent performance, though the practice is increasing.78 And as states develop more effective ways to measure teacher quality, districts should be better able to incorporate performance data when making compensation decisions. Federal policy has helped encourage a shift away from strict lockstep salary schedule systems. In addition to ESEA waiver requirements that districts incorporate evaluation data into personnel decisions (though compensation isn’t specified), the Teacher Incentive Fund (TIF), a federal grant program that has allocated over $2 billion since its inception, began supporting state and district efforts to implement performance-based compensation in 2006.79 Grantees from across the country have included Miami-Dade County Public Schools, Mississippi, Pittsburgh Public Schools, Seattle Public Schools, and Washington, D.C. Public Schools (see Case Study: Lessons From Washington, D.C.’s IMPACT System). In addition to encouraging performance-based pay, another key purpose of TIF was to increase the number of high-quality teachers in challenging environments such as high-needs schools or hard-to-staff subjects through targeted compensation. Because of the relative rarity of true performance-based teacher compensation systems, research on outcomes of differentiated pay is scarce, and the results are mixed. In addition, compensation research experts note that research designs have been limited by the ways performance pay programs are designed and implemented in practice. Therefore, making definitive claims about the outcomes of such programs remains a challenging task.83 Some studies find no link between financial incentives for student achievement and higher test scores, while others see higher achievement for students in systems with performance bonuses.84 A large-scale 2014 study on TIF presented findings on early implementation from 153 districts. Fewer than half the districts carried out all required components of the grant, potentially indicating implementation challenges with pay-for-performance systems.85 The relative impact of the programs evaluated depended on program design elements such as the amount of compensation provided, the link between individual efforts and rewards, and whether the funding is perceived as temporary or permanent (see sidebar on Washington D.C.’s IMPACT system). As the practice becomes more common, additional research on the impact on both student performance and other potential effects related to new teacher recruitment and retention of effective teachers is warranted. In some states, tenure systems are being challenged prominently in court — as evidenced by the polarizing 2014 Vergara v. California ruling, which initially found teacher tenure laws in California unconstitutional. A unanimous state appellate panel reversed the trial court’s decsion, and a petition for review in the state supreme court is expected. 89. Yet making large-scale changes to long-standing teacher tenure policies is controversial. Developing policies to measure and improve the effectiveness of teachers who are part of the current workforce approaches teacher quality from one angle. But system-level change in teacher quality also requires understanding and influencing the quality of new entrants into the profession. Entering a public school classroom is a multistep process. In all states, teachers are required to meet state licensing requirements to be employed in most public schools.93 Although specific standards vary by state, the basic process universally requires a bachelor’s degree, passage of state licensing exams, and completion of an accredited teacher preparation program. Federal policymakers, as well as some state ones, are beginning to push for higher-quality teacher preparation programs proven to produce graduates who can have a positive impact on student achievement. There are two broad types of teacher preparation programs. Traditional teacher preparation programs are typically offered by colleges and universities, run concurrently with an undergraduate or graduate degree program, and include instruction both in content area and teaching pedagogy. Most programs also include a student teaching experience during which teacher candidates are paired with classroom teachers to gain experience in a real-world setting. Student teaching requirements vary significantly in length among states and programs. In addition, standards for selecting mentor teachers and other factors that could affect the quality of the student teaching experience vary widely. The current evidence base of teacher quality across certification pathways does not point to one route as being more effective than the other. In fact, the variation in effectiveness within pathways is far greater than the average differences between pathways.95 In other words, individual programs of both types produce teachers who are more or less effective, and there is little evidence that either type of teacher preparation program is systematically better able to train an effective teacher. Many states have designed alternative certification programs to be very similar to traditional ones; the primary difference is that candidates are already in the classroom while they complete coursework. And among programs within the same category, there is often a great deal of variation in selection criteria, coursework, and practice.96 A large-scale study of 20 school districts, sponsored by the U.S. Department of Education, did not find significant differences between traditionally and alternatively certified teachers in their ability to improve student performance.97 Certain alternative programs produce promising results; evaluations of Teach For America corps members, for instance, show a positive impact on math outcomes for elementary and secondary students.98 And a separate study in North Carolina found that Teach For America teachers outperformed other teachers in multiple subjects and grade levels and in other measures of performance assessed against state teaching standards.99 However, it is difficult to extrapolate Teach For America’s results to alternative certification programs generally, given both the competitive nature of the program’s selection process and the unique nature of its training. There is also a burgeoning movement for preparation programs to hold themselves accountable for the outcomes of their graduates. In higher education, colleges and universities must be accredited to qualify for federal financial aid dollars, such as Pell grants. Additionally, specific programs within colleges seek out specialized accreditation. In most states, teacher preparation programs choose whether they want to seek out this specialized accreditation, while other states require programs to pursue accreditation to receive the state’s permission to license new teachers. There are still questions about whether CAEP can enforce stricter standards over the long run — it is, after all, still reliant on a self-policing model where the accreditor has little incentive to hold programs accountable — but it shows signs of promise. Once enacted, CAEP’s standards will require programs to slowly raise the admission requirements for new teachers and will require programs to use data to evaluate the impact their graduates have on student learning outcomes. Though not yet reflected in the research linking assessment performance to teacher effectiveness, the use of performance-based assessments for teacher candidates is rapidly gaining traction, with the edTPA instrument, developed by Stanford University and partners, at the forefront. Through performance-based assessments, candidates submit a portfolio of work, including lesson plans, video clips of actual teaching, and other materials, for evaluation. Field testing of edTPA ended in 2013, and teacher preparation programs in 33 states use it in some capacity.111 Some states are beginning to require some form of performance-based assessment as a condition of licensure. Yet school districts’ hiring practices remain relatively outdated. For example, districts may only recruit new teachers from local teacher training programs rather than nationally — limiting their ability to screen a greater number of applicants for top talent. Hiring processes in school districts also tend to be highly centralized, limiting the ability of school leaders to choose the best educators for their schools. Such policies and approaches to hiring limit the ability of school leaders to make the best choices for schools’ specific needs from the broadest pool of talent possible and may prevent talented teachers from securing positions in a timely fashion or at all. Research finds that disadvantaged students are more likely to be assigned to less-effective teachers. And schools serving high proportions of disadvantaged students are more likely to employ less-experienced teachers and lower concentrations of teachers deemed highly effective. With highly effective teachers shown to have a stronger impact on student achievement than even many of the background characteristics common to students in high-needs schools, the equitable distribution of highly effective teachers arises as a critical issue. 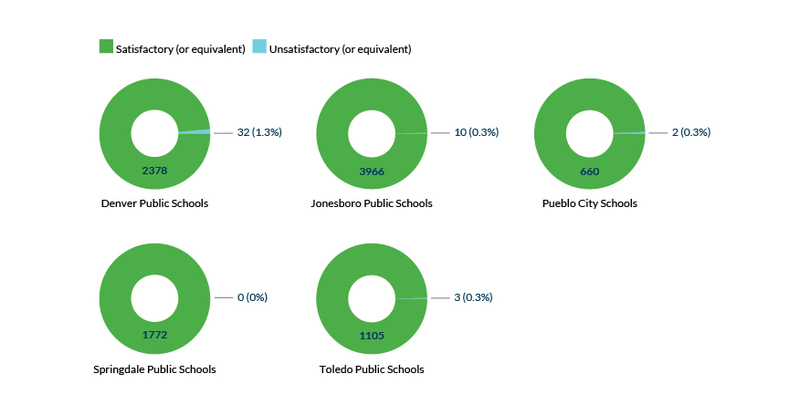 General policies incorporating data on effectiveness into personnel decisions regarding hiring and placement can help mitigate the overall concentration of ineffective teachers as well as their distribution among schools. To date, only Rhode Island has implemented a state policy preventing the assignment of students for multiple years to teachers rated ineffective, though local policies may vary. See the Center for American Progress’s Attaining Equitable Distribution of Effective Teachers in Public Schools by G. Partee (April 2014) for a summary of research. In recent years, alternative approaches to developing school leaders have emerged — including efforts to improve existing routes and accountability for both programs and principals, to develop new pipelines for potential leaders, and to provide alternative training programs for aspiring school leaders. Because many of these programs are relatively new, there is little rigorous evidence on their effectiveness in producing principals who improve student outcomes. The New Leaders Aspiring Principals program, a national program that prepares principals through a residency-based program, is one of the few programs that has been the subject of a rigorous, independent evaluation. The study found that students who attended schools led by New Leaders principals experienced slightly larger achievement gains on average than did similar students in schools led by non-New Leaders principals.131 While these results are promising, more research and data collection on both new and existing programs is needed to inform policy efforts to improve principal preparation. It is clear that most states and districts are in some stage of transition in tying data on teacher effectiveness to critical decisions regarding compensation, tenure, hiring, and dismissal. Though practices like incorporating student achievement measures into the teacher evaluation process are becoming widespread, the application of that information to personnel policies remains highly variable across the country. For instance, more and more states allow for districts to factor performance into decisions regarding tenure and dismissal, but relatively few states require performance to enter into these decisions. And few districts factor performance information into compensation structures. The linchpin in systemically improving policies tied to effectiveness for both the current teacher workforce and for the preparation of future teachers is information. The quality, fairness, and reliability of teacher effectiveness measures will make or break any policy aimed at identifying and rewarding highly effective teachers, exiting low performers, and preparing and supporting new teachers or those struggling somewhere in the middle. To that end, the role of research and advocacy as new approaches mature is critical to shaping the policies that will drive teacher quality. 2007 was a pivotal year for D.C. Public Schools (DCPS). Chronically struggling schools and low student performance spurred D.C. into action. As school chancellor, Michelle Rhee implemented several reform efforts, including developing a rigorous teacher evaluation system known as IMPACT. IMPACT is distinctive for multiple reasons, including its use of multiple indicators to assess teacher quality, multi-tiered framework for performance categories, and link to high-stakes consequences and incentives. Tennessee became one of the leading states in teacher preparation reforms after passing landmark legislation in 2007. Tennessee’s changes to how it evaluates teacher preparation programs are a significant shift from the more traditional focus on input measures.